Two young boxing trainees at the IIS. 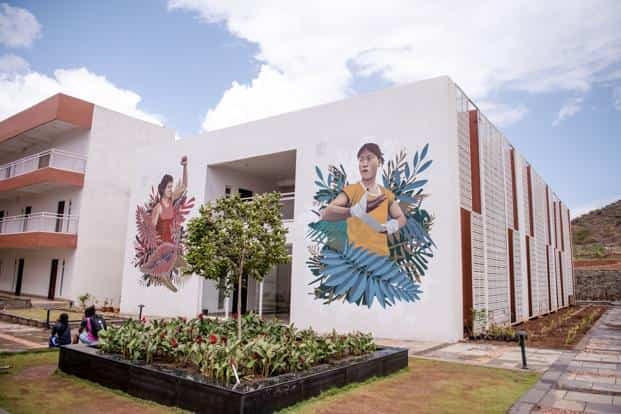 Every morning when Tababi Devi walks out of her hostel building, she’s greeted by two massive paintings on the front wall of the boy’s hostel located on the same campus. The paintings stand out against the bare, white wall. One of them shows the wrestler Sakshi Malik, in a red singlet, raising her arm, possibly after a victorious bout, while the other one features boxer M.C. Mary Kom taping her fingers with an I-mean-business look on her face. Like Mary Kom, Devi, 16, is from Manipur. And like every other girl from the state, she too has been inspired by the boxer to take up sport, and believes that it can change lives. Come October, Devi will be the first Indian judoka to participate in the Youth Olympics in Buenos Aires. When she starts her day every morning, Devi can’t help but look at the wall featuring the two Olympic bronze medallists and remember why she’s here. Devi is among the 100 young athletes, aged 12-16, who are currently training at the Inspire Institute of Sports (IIS) at Vijayanagar in Bellary, Karnataka—India’s first privately funded high-performance Olympic training centre. The facility, which officially opened on 15 August, is owned and run by the JSW Group, part of the O.P. Jindal Group. The setting stands out. The facility, more than 300km from Bengaluru, is nestled amid hillocks. There is very little pollution, the weather is pleasant for almost 10 months of the year, and everything inside the campus is within 5 minutes walking distance. “When I was given the contract to work on this facility, I wanted it to be like a monastery," says architect Alok Shetty. “A place where children could learn their craft and hone their skills without any distraction." It took Shetty and his colleagues more than 400 visits to the mining town and over four years to bring the campus to life. The campus, built on 42 acres, can train and house 300 students at a given time. The focus is on five Olympic disciplines at the moment: boxing, wrestling, judo, swimming and track and field. The diverse staff of 40 from eight countries work at the institute’s different facilities—a combat hall, a high performance centre that houses a state-of-the-art gym, a sports science centre, physiotherapy rooms, hot and cold tub facilities for recovery, a sprawling cafeteria, and even an academic block. “The age group of the children here is between 12-16, and for us, their academic welfare is of equal importance," says Mustafa Ghouse, CEO, JSW Sport. “That’s why we have teaching staff here who teach students from classes VI-X." Athletes are selected from across India after extensive scouting at various levels and through several competitions. Once at the IIS, they undergo basic physiological tests and training. “If the coaches observe after a certain amount of training that the child is not good enough and may not have a future in sport, we let go of him/her," says IIS CEO, Rushdee Warley. “There’s no point wasting their time, and we can scout again and get in somebody more deserving." The art installations and walls with photos and infographics give one a feel of the Olympic Museum in Lausanne, Switzerland. In fact, there’s plenty of research and reference from international training centres. “We visited several Olympic training centres in the US, UK, Australia, Qatar, South Africa and studied the Olympic models of these countries," says Parth Jindal, founder, IIS. “And we tried to learn training concepts from them." For instance, after studying the techniques and body type of Indian wrestlers, the coaches came to the conclusion that they’re top heavy and don’t use their legs enough while fighting. In Japan, a country that has the world’s best wrestlers, they learnt the concept of cross training and implemented it in India. “The wrestlers and judokas train together in the same hall here for a reason. Leg movements are key in judo, and often to teach leg movements to a wrestler, we include a judoka in the wrestling session. So we feed off each other," says judo coach Jeevan Sharma. Sharma finds himself in the unique position of having worked with a government facility for years, the Sports Authority of India in Bhopal, before joining IIS. “It is very different," he says. “It’s not that our SAI facilities are lacking in any way. If you visit the National Institute of Sports in Patiala or the SAI campus in Balewadi (Pune), you will see similar features. But there are no experts there to use those machines and facilities. Often they don’t know how to use them, so the facilities are being wasted there. Moreover, since there are so many children in SAI centres, there’s no scope for individual attention." Boxer Nikhat Zareen, who finds herself here when she’s not at the national camp, says the smallest things often make the biggest difference. “At the camp, the kitchens are often not the most hygienic; the food is too spicy for us at times. There can be issue with water or electricity supplies anytime." What’s unique though about IIS is that its doors are open for everyone—the plan is for the institute to be reimbursed by the sports ministry for the non-residential athletes sent to train there. “Sports minister Rajyavardhan Singh Rathore has had a look at the facility here and has asked us to take over three SAI Centres in a PPP (public-private partnership) model," says Jindal. “We can use the SAI Centres as feeder centres, and make IIS the home of Indian sport in some sense." For years, exposure trips or the lack of them have been a hurdle for Indian athletes. That’s another area where the IIS aims to step in. “We are in touch with Olympic training centres from around the world, and will be inviting their athletes to come and train here, and, as part of an exchange programme, send our athletes to them," he says. The IIS has been in use for over a year now, with athletes like javelin thrower Neeraj Chopra and Asian Games gold medallist wrestler Vinesh Phogat having undergone extensive rehab and training programmes at the facility. And while combat sports remains the key focus, the facility is available for other athletes as well. In some sense, that is also a revenue-earning technique for the owners who have an estimated starting budget of ₹ 5-6 lakh per athlete per annum. Last year, football clubs Mohun Bagan, Minerva Punjab, Bengaluru FC and Churchill Brothers all used the facility for conditioning camps. This year, three kabaddi franchises have been on the campus already. Recently, the national boxing camp was held here too. “That’s the model with which we can break even, after which we can think of long-term revenue earning," Jindal says.